"...there are now in successful operation in Cincinnati three well-equipped cable railways..." (Perrysburg Journal. (Perrysburg, Ohio)), Friday, April 13, 1888). The three Hallidie-type cable car lines in Cincinnati. 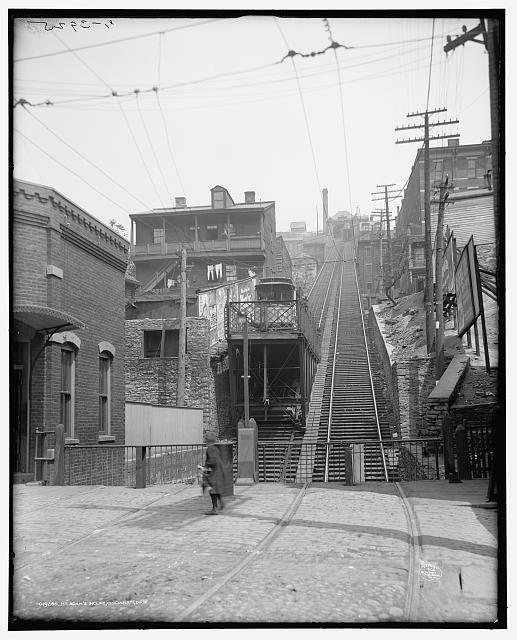 The Mount Adams Incline preceded the cable car line and survived long past it. cars: horse cars with detachable grips, later single-ended dummy & trailer trains. notes: In 1876 the Mount Adams and Eden Park Inclined Railway, a funicular, opened to connect the low-lying business district with the Eden Park residential district. George B Kerper, a Civil War veteran, was president of the company. 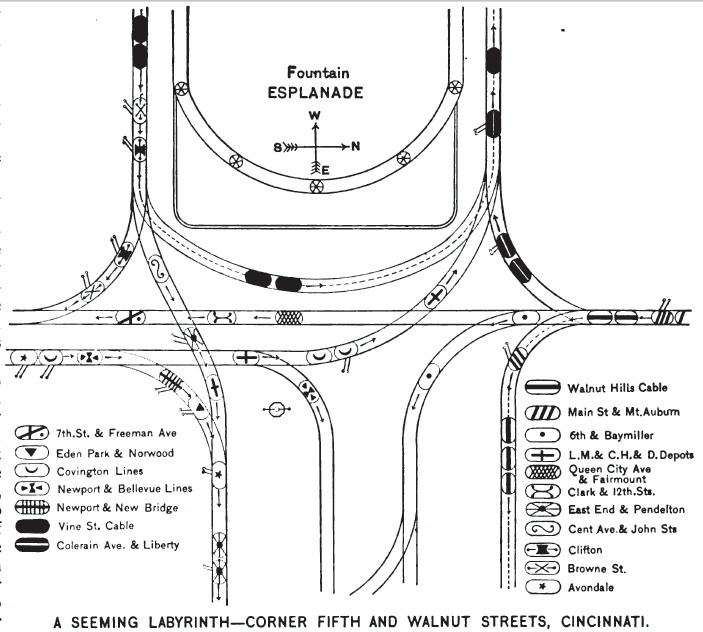 In the following years, the company opened a horse car line to connect the base of the incline with Fountain Square downtown and another line to from the top of the incline into Eden Park. In 1880, the company connected the lower and upper horse car lines by making the funicular cars into open platforms with tracks to carry the horse cars. Engineer Henry M Lane did the work. Looking up the Mount Adams Incline about 1906. By this time, the incline was carrying electric streetcars. (Source: Library of Congress. LC-D4-19280). 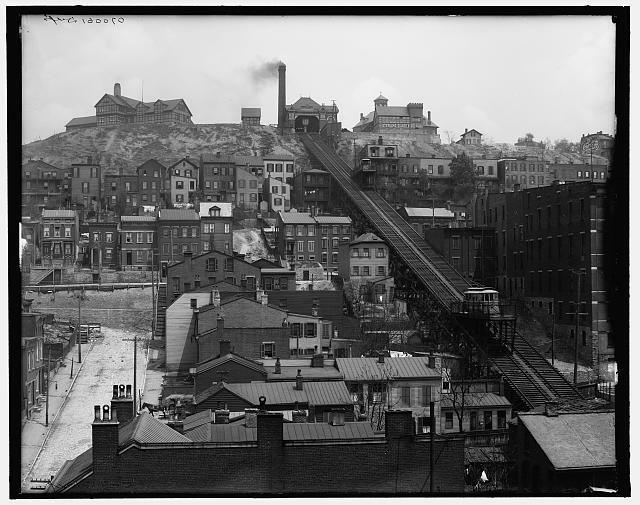 A view of the Mount Adams Incline between 1900 and 1910. (Source: Library of Congress. LC-D4-70061). September, 2011 Picture of the Month. Looking down from Mount Adams as a streetcar rides the incline to higher ground. (Source: Library of Congress. LC-D4-73362). In 1881 the rival Cincinnati Consolidated Street Railway proposed to convert its Gilbert Avenue horse car line to cable traction. This line would have offered competition to Kerper's horse car line and incline. Kerper fought the Consolidated and purchased the Gilbert Avenue line in return for cash and stock in his company. 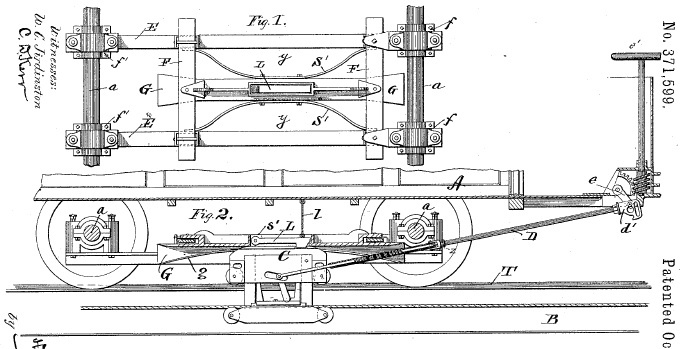 A drawing from Henry Lane's patent 371599 shows how the grip could be attached to a horse car. Lane installed cable only on the hilly portion of the line. Horse cars picked up grips at the top and bottom of the hill without having to stop. The cable system started operating on 08-July-1885. In 1886, the rest of the horse car line was converted. The line had a large number of curves, which caused strain on the cable, resulting in an accident on 02-October-1887 when a strand got wrapped around the grip and caused car 64 to run away. It hit other cable cars and a horse car. Read "CABLE CAR ACCIDENTS". The incline and its horse car line had been converted to electric traction in 1890. Cable traction lasted until 01-February-1898 on Gilbert Avenue. The incline lasted untill 16-April-1948. A Mount Adams and Eden Park Railway cable train lays over on the Blair Avenue loop at the outer end of the line. (Source: Don Prout's Greetings from Cincinnati. All rights reserved. Used with permission.) March, 2011 Picture of the Month. From The Street Railway Journal, June, 1885. Volume I, Number 8. The Mt. Adams & Eden Park Inclined RR. Co. of Cincinnati, O., are building and will have in operation July 10th one and one half miles of cable road. It is built under patents of H. M. Lane, M.E. From The Street Railway Journal, August, 1886. Volume II, Number 10. Work has been commenced at Fountain Square and Walnut Hills on the cable railway. From The Street Railway Journal, July, 1889. Volume V, Number 7. At Cincinnati, the new line of electric cars recently installed by the Daft Co., runs for a short distance over the Gilbert Avenue cable line. Just in front of the powerhouse, the cable, which is in two divisions, ends; and for a short distance the trains of two cars passing this point have to release their grip from one cable and travel by momentum alone until they take hold upon the other. As it frequently happens that the momentum of the train is not sufficient to carry it across, a winding drum with a cable attached has been placed at the point of division,and is used to bridge the gap. Recently, a car was sent out with a new grip, which was a little too large, and upon arriving at the point referred to, the grip jammed in the slot. The winding cable was attached and the drum started, but the car did not move. While preparing for another trial, one of the electric cars came along, and with no very apparent effort pushed the cable car in front of it until it could take hold upon the cable. This was done on a slippery track, and is a very clear demonstration of the ease with which the electric motor encounters difficulties, and the large reserve force, so useful in emergencies, which it possesses. 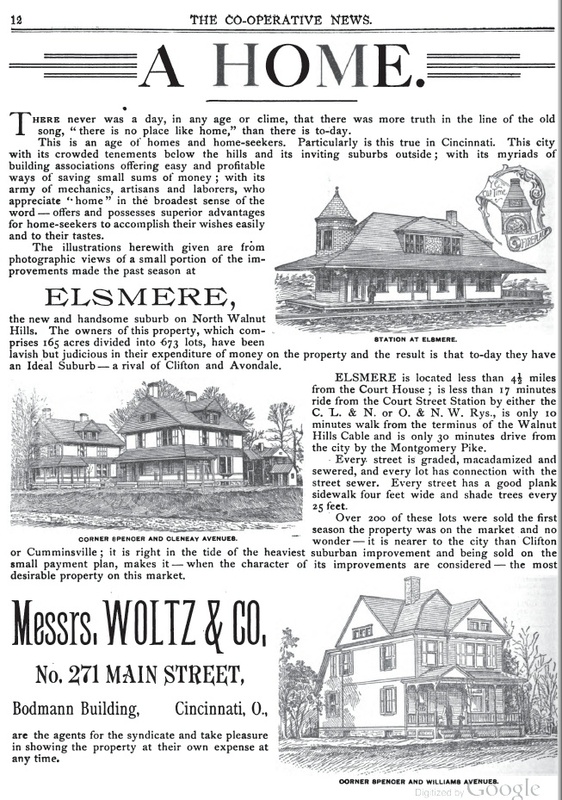 An advertisement for the Elsmere real estate development "only 10 minutes walk from the terminus of the Walnut Hills Cable." From The Cooperative News, Volume I, Number 4, February 15, 1890. 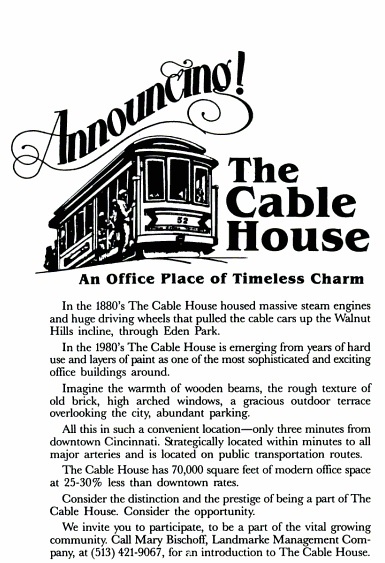 An advertisement for the Cable House. From Cincinnati Magazine, November, 1984. The former Gilbert Avenue powerhouse is now an office building called the Cable House. Peter Ehrlich visited Cincinnati in 2016 for the opening of the Cincinnati Bell Connector. He took photos of the Gilbert Avenue line's powerhouse and carbarn. Peter Ehrlich photo. All rights reserved. Note the "Cable House" sign. Peter Ehrlich photo. All rights reserved. Mt. Adams and Eden Park Inclined RR Co. Main line (cable, 8; horse, 8), 16 miles; gauge, 5 ft. 2 1/4 in. ; rail, 42 Ibs. ; owns 140 horses and 130 cars. Chartered in 1873. Operations for year ending September 30, 1888. -- Earnings, $221,068.58'; expenses, $130,475.76 -- net earnings, $90,593.82. Financial Statement, September 30, 1888. -- Common stock. $1,000,000; preferred stock, $7,150; 1st mtge. bonds. $250,000; 2d mtge. bonds, $124,000; consolidated mtge. 5 per cent. 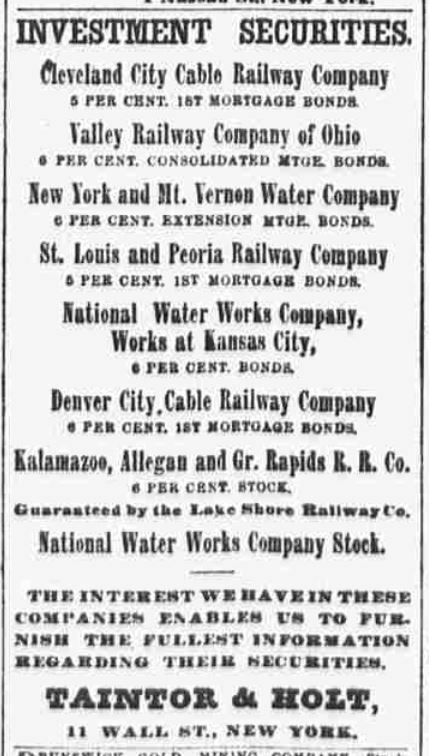 20-year bonds, due March, 1906, $372,000 ; loan account, $170,000; bills payable, $3B,000; accounts payable, $4,269.71; profit and loss, $36,634.43 -- total, $2,000,054.14. Contra; Construction, etc., $860,427.15; real estate, $320,065.57; equipment, $96,628.94; other investments, $624,513.48; sinking fund, $23,450; City of Cincinnati, $10,403.67; cash and other assets, $36,565.33 -- total, $2,000,054.14. Directors: Jas. E. Mooney, S.M. Lemont, Jno. E. Bell, Jno. Kilgour, Joseph Rogers, Jas. R. Murdock, Geo. B. Kerper, Cincinnati, O. Officers: Jno. Kilgour, Pres. ; Jas. A. Collins, Sec. & Treas. ; Jno. C. Weaver, Supt. GENERAL OFFICE, Cincinnati, O. From Cincinnati: A Guide to the Queen City and its Neighbors By the Federal Writers' Project, 1943, page 257. MOUNT ADAMS INCLINE, extending from Lock St. to Rookwood Pl. and Celestial St., is the more important of two local inclines -- the survivors of five traffic elevators that once carried Cincinnatians to and from their homes in the suburbs. 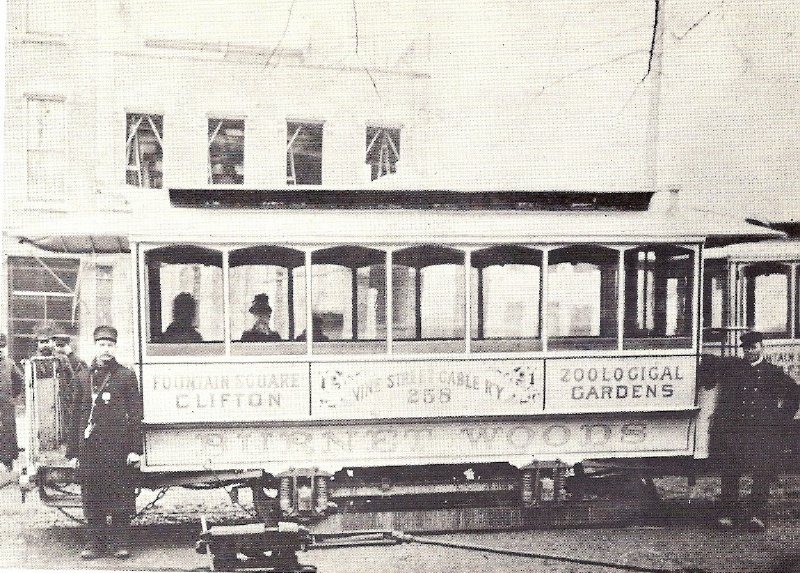 The incline comprises two stilted, cable-drawn platforms that raise the Zoo-Eden Streetcars 268 feet from Lock Street to the hilltop on an inclined track 945 feet long. Automobiles also are carried on the incline. The understructure all along the hillside, over house tops and streets, is of stout lumber. Vine Street Cable Railway car 258 is shown at Vine and Molitor Streets, with a grip on display. (Source: Don Prout's Greetings from Cincinnati. All rights reserved. Used with permission.) May, 2011 Picture of the Month. opened: 25-September-1887. Loop in Fountain Square to Vine Street. Vine to powerhouse at Vine and Jefferson Avenue. cars: Single-ended dummy & trailer trains. notes: The success of the Mount Adams and Eden Park Railway's cable car line led the Cincinnati Street Railway to lay cable on Vine Street, from Fountain Square to the Clifton area. 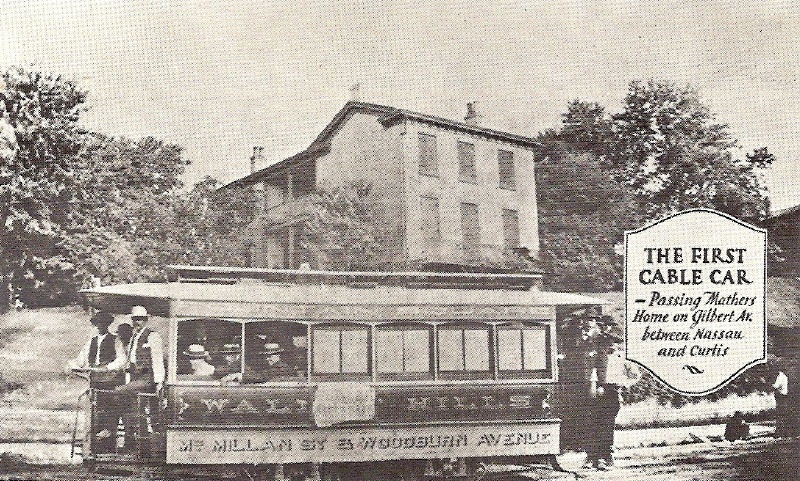 James Kilgour, owner of the company, engaged engineer Henry M Lane to design and build the Vine Street line, as he had the Mount Adams and Eden Park's Walnut Hills line. The Vine Street line was converted to electric operation on 16-September-1898. From The Street Railway Journal, February, 1887. Volume III, Number 4. The Cincinnati St. Ry. Co. write us that among their contemplated improvements are the building of the Vine street cable railway, about 6 miles long, and the introduction of electric motors on the Avondale road, 6 1-2 miles, and the Price Hill line, about 3 miles. Cairo, III. From The Co-Operative News, February 15, 1890. Volume I, Number 4. The Vine Street Cable sold $1500 at a good premium, and installed the following officers : J. G. Fritsch, president; John Kauffmann, vice-president; OttoC. Arens. secretary ; Emile Schmitt, treasurer. From The Co-Operative News, April 1, 1890. Volume I, Number 7. Vine Street Cable Loan and Building Company. -- Money on hand. Sold $1000.00 at a good premium. From The Street Railway Journal, June, 1897. Volume IX, Number 1. A SEEMING LABYRINTH -- CORNER FIFTH AND WALNUT STREETS, CINCINNATI. The intersection of Fifth and Walnut Streets at Fountain Square, in Cincinnati, during the busy portion of the day, presents a most interesting scene. Twenty-one street car lines pass this corner, and, to an observer who is not acquainted with the care with which the different cars, horse, cable and electric, are directed to their proper tracks, it often seems as if a block would certainly result. In spite of the complication, it is an interesting fact that blocks are comparatively infrequent, and that accidents are extremely rare. In fact, it is said that a serious accident has never occurred at this point, a fact which is greatly to the credit of the street railway authorities, and a testimonial to the skill of the drivers, motormen and gripmen who handle the cars. The accompanying diagram gives a view of the different tracks and the lines of cars which cross at this corner. From The Street Railway Journal, June, 1897. Volume XIII, Number 6. An addition has been made to the Hunt Street station, so that it will furnish power to operate the Vine Street cable and the Walnut Hills cable lines with electricity. One-hundred and twelve new closed cars have been purchased from the Laclede Car Company. These cars are 18 ft. in length with cushioned seats and backs. "Some Funny Bets" (The Hocking Sentinel, (Logan, Ohio)), Thursday, November 15, 1888). Two Vine Street conductors make an unusual bet on the presidential election. "Her Pretty Teeth" (Wichita Eagle, Tuesday, October 29, 1889). Reprinted in many newspapers, this joke was set on a Vine Street cable car. "Yakey in Cincinnati." (The National Tribune), Thursday, August 10, 1893). A Vine Street employee keeps in touch with a conversation club in Washington, DC. From The Street Railway Journal, November, 1897. Volume XIII, Number 11. Cincinnati, O. -- The Cincinnati Street Railway Company is about to change the motive power of its Walnut Hills and Vine Street lines from cable to electricity. 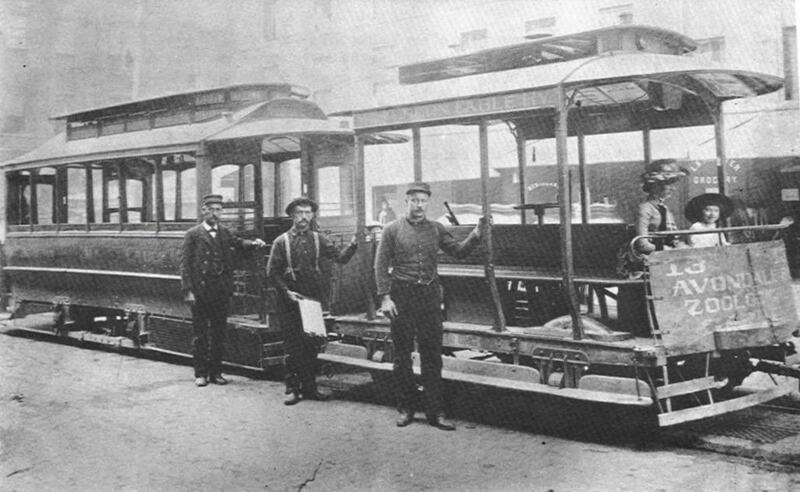 Mount Auburn Cable Railway open grip car 13 and a closed trailer, with crew and two passengers. (Source: Don Prout's Greetings from Cincinnati. All rights reserved. Used with permission.) May, 2011 Picture of the Month. opened: 13-March-1888. Fourth Street and Sycamore Street on Sycamore to Auburn Street. Auburn to Saunder Street (now Dorchester). Saunder to Highland Avenue. powerhouse: Saunder Street (now Dorchester) and Highland Avenue. 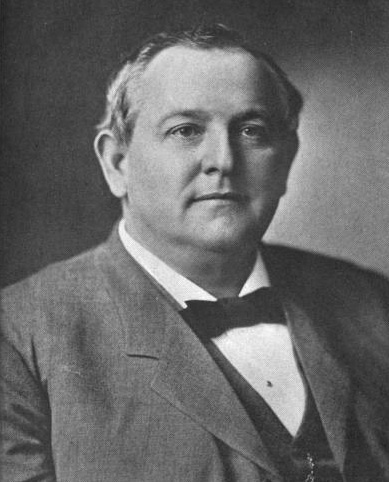 Henry Martin promoted the Mount Auburn Cable Railway to connect downtown with Avondale, where he was involved in real estate developments. Engineer Worcester Haddock designed the line without using trust patents. The line was built cheaply, which led to operational problems, such as the slot closing in cold weather. Broderick & Bascom have taken the contract for supplying the Mt. Auburn Cable Railroad Co. a cable 1 1/4 in. diameter, which is to weigh 2 1/2 lbs. to the foot, and is to be adapted to four miles of double track. The cable is to be taken up the hill in two sections. 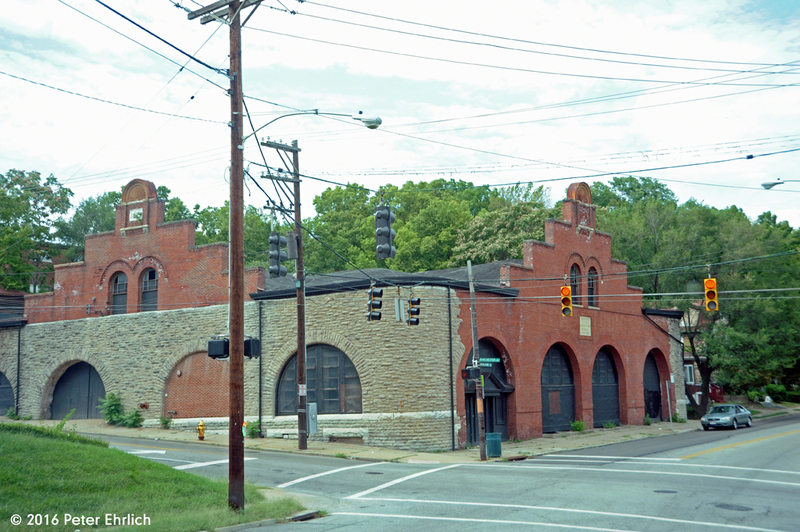 The company has a force of 100 men employed in grading Highland avenue and at work on the engine house. The plant has a sixteen foot basement, and the walls are completed to the top. It is very likely that the house will be made two stories high with a pitched roof on top of the basement. The company are simply waiting for some slot iron to be delivered before they commence tearing up the streets, and this is expected at any time. From The Street Railway Journal, June, 1888. Volume IV, Number 6. Proposals for constructing and operating a street railway by electricity or otherwise will be received until June 2, addressed to the Board of County Commissioners, Cincinnati, Hamilton County, O., Henry Schlotman, Jr. clerk of the Board. The Cincinnati Street Railway company is going to adopt an electric motor on its Camp Washington line and later it will put in use upon other portions of the system. 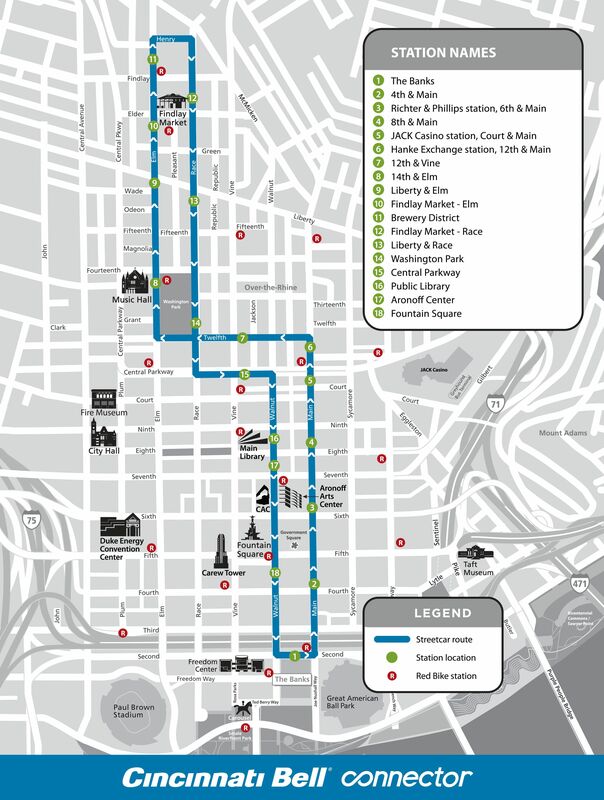 Routes have been selected for two crosstown lines; one from Browne street through MeWicken avenue, to Main street; the other from Elm street to the Walnut Hills road and the Mount Auburn cable road. The latter will be built by the Cincinnati Street Railroad Co.
From The Street Railway Journal, August, 1888. Volume IV, Number 8. The Mount Auburn Cable Company has completed and opened its line to Avondale. "The board of public works of Cincinnati refused to grant privileges to the Mount Auburn Cable Railroad company to construct a cable road on Sycamore street to the Zoological garden." (Daily Evening Bulletin (Maysville, Kentucky), Wednesday, June 10, 1885). Despite this, in 1889 Martin built a line along Erkenbrecker Avenus to the Cincinnati Zoo, using a rail coach with a steam engine which drove a winch which let out and pulled in a cable, letting the car descend the hill from the zoo to a connection with the cable line at Burnet Avenue and drawing the car up the hill towards the zoo. The city destroyed the line when it repaved the street in 1892 and refused to allow it to be rebuilt. The line was out of commission for over 100 days, and never recovered financially, eventually forcing Martin to sell out to Kilgour's Cincinnati Consolidated. The Consolidated operated the cable line until 09-June-1902, and then converted it to electric traction. From The Street Railway Journal, February, 1888. Volume IV, Number 2. Grip car of the Mt. Auburn Cable Railway, Cincinnati, Ohio. (Source: The Street Railway Journal, February, 1888. Volume IV, Number 2). June, 2011 Picture of the Month. 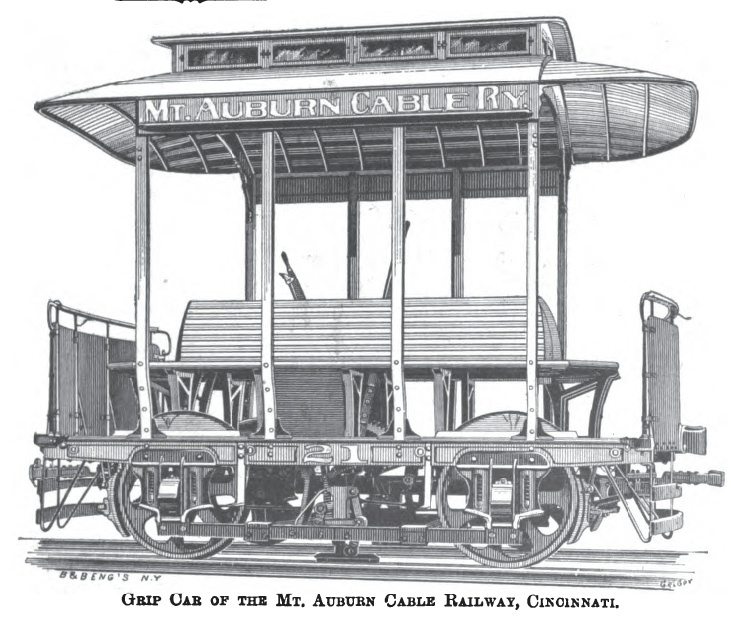 We show herewith cuts of grip and closed cars recently built for the Mount Auburn Cable Railway, of Cincinnati. These cars are fitted with two new devidex, recently patented by the J. G. Brill Co. The exceedingly steep grades in Cincinnati have been the cause of several serious accicents, caused by the cable cars getting beyond the control of the driver; with this in view, the grades on the road being over 13 per cent, these cars were equipped with an improved and powerful track brake, which is quickly applied and very powerful, and will hold the loaded car in a few seconds on the steepest grade. The Mount Auburn road is considered one of the best appointed cable railways in the United States, and the managers determined to spare no expense in any outlay that would conduce to the safety and comfort of passengers as well as to the permanent character of the structure. These brakes can be worked from either platform, and are in addition to the ordinary brakes which are used on the levels. The other improvement is for carrying the grips; this carrier is suspended upon saddles and stirrups from the boxes, and is claimed to possess advantages over any other systems in use. It differs from the Chicago system in not being subject to the action of the car springs, and from the Lane system in not being subject to the lateral motion of the boxes, and different from the Philadelphia system in not having any wearing parts. It is put on the only part of the car where perfect parallelism with the rails is assured, and is simple and inexpensive. The Mount Auburn company has ordered an additional lot of 11 cars, fitted with these improvements, from the J. G. Brill Company. Closed car of the Mt. 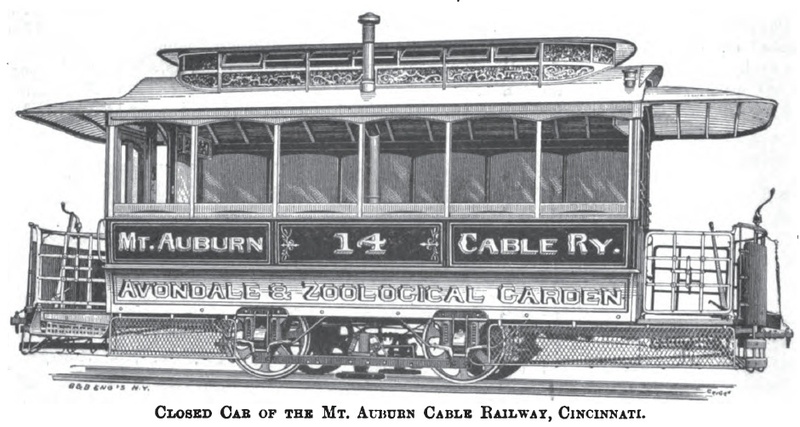 Auburn Cable Railway, Cincinnati, Ohio. (Source: The Street Railway Journal, February, 1888. Volume IV, Number 2). Peter Ehrlich visited Cincinnati in 2016 for the opening of the Cincinnati Bell Connector. He took photos of the Mount Auburn Cable Railway's powerhouse and carbarn. The mixed stone and brick construction is a result of a fire in 1892. Peter Ehrlich photo. All rights reserved. 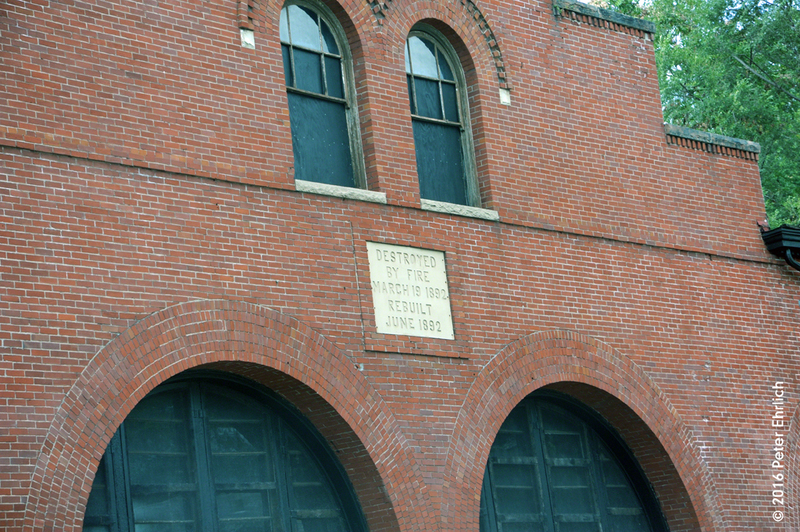 A plaque on the Mount Auburn Cable Railway's powerhouse and carbarn commemorates the 1892 fire. Peter Ehrlich photo. All rights reserved. The hills which form the boundary lines of so much of the City proper, threatened at one time to prove a serious barrier to its growth, and to interpose grave obstacles in the way of the full enjoyment by the great names of the people of the pure air and delicious scenery of such beautiful spots as Mt. Auburn, Clifton, Mt. Adams, Burnet Woods and Price's Hill. For all but the happy few who were able to keep their own horses and carriages in the City, all opportunities for recreation were limited to the resources of the valley, thickly covered with houses and extending from the Ohio on the South to the foot of these hills on the East, North and West. The disadvantages thus entailed upon the people were mooted for terracing the whole surrounding steep ascents, and it was even proposed to dig passage ways by running through the acclivities. Both plans were defeated, owing to the enormous expense involved beyond all proportion in excess of the comparatively meagre advantages they would have conferred. The difficulties of providing easy and rapid transit from the crowded streets beneath to the summit of the hills, and the beautiful well-wooded and spreading uplands beyond, seemed for a while insuperable, but all were at length overcome by the happy expedient of the Incline Railways. They were the natural supplement to the whole system of the street passenger cars, and at once opened all the gates to what to most had been a forbidden region, tempting as it was with its cool, invigorating atmosphere, its groves of shade trees and rich green turf. There are four of these Inclined Planes leading to the several hill tops. The Mount Adams and Eden Park Inclined Railway starts from Lock street, near Fifth, a short half mile east from Fountain Square. Its length is 1,000 feet, and the elevation 350 feet above the level of the Ohio. The Plane, with its connections, cost nearly $500,000. 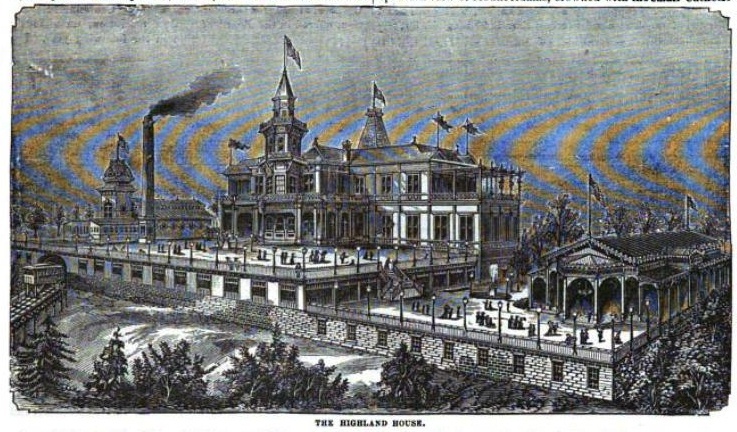 The principal attraction at the head of the Incline is the Highland House, an immense and costly structure in many terraces and compartments, the daily resort of thousands in summer, especially on the evening of the numerous concerts. There is also a pony track and a riding school. The connection from the head of the Incline to the Walnut Hills is by the Eden Park, Walnut Hills and Avondale St. R. R. This road runs through Eden Park and overlooks the City on the west and the river and Kentucky hills on the east. In order to correctly understand the situation of the City, the visitor should cross on the steam ferry that leaves the foot of Lawrence street every few minutes for Newport. While crossing, a splendid view of Mount Adams, crowned with the small Catholic church of the Immaculate Conception, which stands out clear against the sky, and is visible from almost every part of the City, is obtained. Mount Adams is very interesting, from the fact that it is the view upon the greatest elevation to be obtained from the eastern outskirts of the city. The ground originally formed a portion of the Longworth estate, and was given to the City by the executors upon the sole condition of maintaining an Observatory, with a competent professor, upon the spot. For some time this was done, and observations were duly taken and recorded; but since the Signal Service has been thoroughly organized in Washington, and the Cincinnati Astronomer placed at its head, the observations have been discontinued, and the instruments, one by one, have been removed, and a new Observatory has lately been built in the northeast, on Mount Lookout. The Mount Auburn Inclined Plane was the first built in the City. Its projectors were looked upon as rash experimenters, and its failure predicted both upon financial and mechanical grounds. Its success, however, has been very great, and the public spirit of its constructors undoubtedly led to the erection of all the others. The power is supplied by a double engine, with cylinders 16 by 36 inches. The usual running time is 90 seconds, but trips have been run in 47 seconds. The third, or safety, rope has no connection with the engine or other draft machinery, and the brakes are so arranged that the engineer can apply all three at once, either of which is so powerful that he can stop the cars at any time within thirty feet. The capacity has never been properly tested; 25,000 have been transported up and down in one day. This Plane connects at the bottom with both Vine and Elm street cars, and at the top with a line running to Corryville, Zoological Garden, Burnet Woods Park, and Clifton, 1 1/2 miles in length, the latter, in conjunction with the Plane, being owned by a stock company, with a capital of $300,000. Price's Hill Inclined Plane -- Runs due west, from the foot of Eighth street to the summit of the hill, close to which is a public garden, a house for refreshments, concert rooms, etc. There are two planes on this line, one for passengers, the other for teams and freight, running side by side, but completely independent of one another. They are each 788 feet long, the angle of elevation 24�, and the grade 44.66 feet in 100. The ropes on the passenger plane are tested to a capacity of 40 tons, and on the freight to 70 tons. The power on the first is of 70 and on the second of 100 horses. The cost of building both was about $150,000. The fare on all these Inclined Planes is the same, viz., five cents for each trip. From The Philadelphia Record Almanac., 1890. 15. 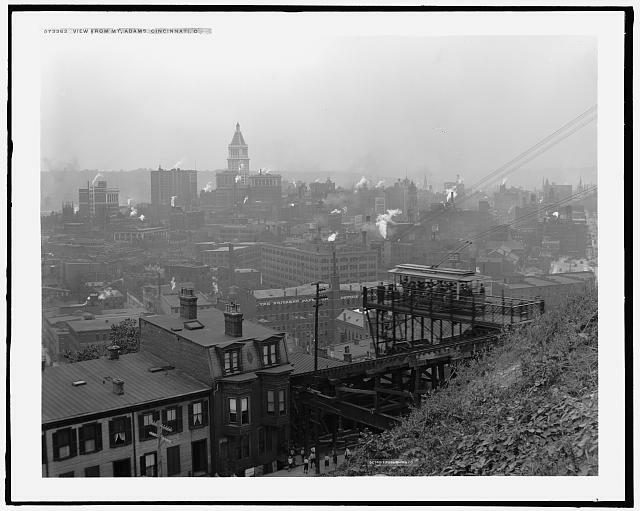 -- Six persons killed and four injured by a cable breaking on the Mount Auburn Incline Plane Railroad at Cincinnati. -- Eighteen persons poisoned by eating oyster soup at Woodbury, N. J. 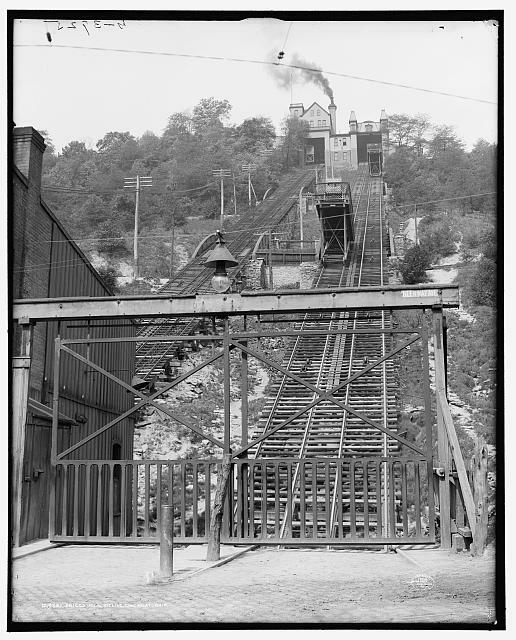 THE MOUNT AUBURN INCLINE ACCIDENT. From The Cincinnati Lancet-Clinic, Volume 62, October 19, 1889. Last Tuesday the people of this city were horrified with the news of the giving way of the cable and car connection on this inclined plane, by which five persons were instantly killed and as many more mortally or dangerously injured. We are not able to inform our readers of the immediate cause of the accident, as the Coroner has not completed his investigations. The man and his wife who always told you so are on the street and just telling it over and over again. However, there are some things in connection with this particular street railroad that call for an explanation from the City Board of Public Affairs, who have control and charge of the streets, and the City Solicitor -- viz. : How and why is it that this corporation has been allowed to occupy the streets with their tracks and cars without obtaining a charter or franchise from the city? And how is it that there has not even been an attempt to collect a car license from the company? It is entirely within the province of the Board of Affairs, who exercise the functions of a Board of Health, to cause an official inspection of all inclined planes and other railways that may be operated in any manner that places life in danger. Such an inspection of the other inclines should be instituted at once. This may appear to be on the principle of "locking the door," etc., but this should be coupled with that other adage, "It never rains but it pours"; and a pour of that particular kind of accident is not a good thing to have. Looking up the Price Hill Inclines. The passenger incline is on the left and the freight incline is on the right. That is a "Herancourt's Fine Bottled Beer" wagon on the nearer car on the freight incline. (Source: Library of Congress. LC-D4-19282). 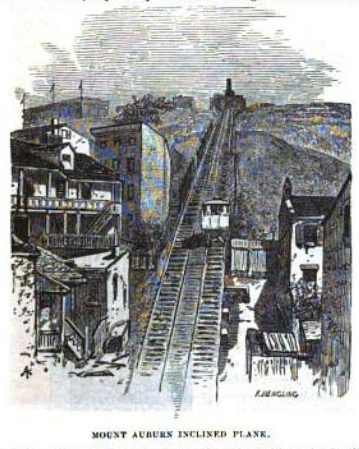 A ticket for Cincinnati's Price Hill Incline. From Cincinnati: A Guide to the Queen City and its Neighbors By the Federal Writers' Project, 1943, page 452. 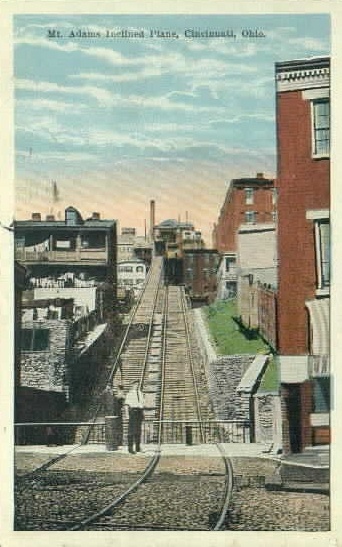 PRICE HILL INCLINE, (fare 5 cents; with streetcar transfer, 10 cents) serves as the continuation of W. Eighth Street up Price Hill. Its eastern terminus is at W. Eighth St. and Glenway Ave.; its western terminus, 350 feet above the base, is on the south side of Matson Ave. at W. Eighth St. It has a double track, 800 feet long, containing moving cables that draw a passenger car on each track back and forth at intervals of a few minutes. Passengers may transfer from inclined plane to streetcar and vice versa, but unlike the Mount Adams Incline this one does not carry streetcars. Streetcar service returned to Cincinnati on 09-September-2016 with the Cincinnati Bell Connector (Cincinnati Bell paid for the naming rights). The line uses five CAF (Construcciones y Auxiliar de Ferrocarriles) Urbos 3 cars, which were assembled in Elmira, New York. 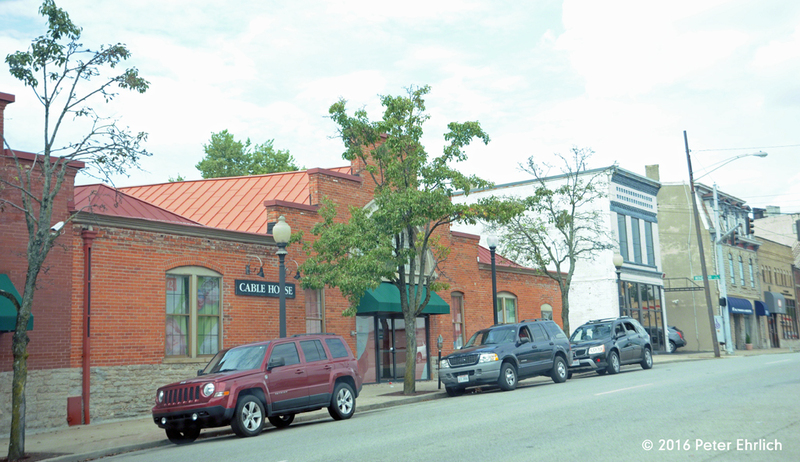 The carbarn is at Henry Street and Race Street. Cincinnati Bell Connector official website. Tom L Johnson, Mayor of Cleveland and traction magnate. notes: Tom L Johnson, a political disciple of economist Henry George, owned traction lines in various cities including Indianapolis and Cleveland. He adopted and promoted a ladder cable system developed by Milton Wheaton. In about 1885 or 1886, he created a short demonstration section on either his Brooklyn Street Railroad or his South Side Railway. The demonstration section worked well enough to allow Johnson to set up the Brooklyn Cable Company, which leased the Park Avenue line of the Atlantic Avenue Railroad in Brooklyn, New York. The system was not a success. From The Street Railway Journal, August, 1885. Volume I, Number 10. W. H. Hazzard, S. L. Husted, Wm. M. Thomas, and James Howe, comprising the executive board of the Brooklyn City Railroad, have been recently inspecting the new cable railroad in Cleveland. From The Street Railway Journal, September, 1885. Volume I, Number 11. According to Mr. Hazzard and the samples of cable brought back by the committee, the appliances differ in almost every particular from those commonly used in the few cable roads now in operation. The cable consists of two wire ropes made up of six one-quarter inch strands, wrapped around a half-inch cotton cord and held an inch apart by steel clamps or cross bars placed at five-inch intervals. This runs over wheels set at a slight angle, not more than an inch below the slot in the roadway, in a conduit just largo enough to hold it. The grip is a big wheel half au inch thick, just fitting in the slot, and looking much like an overgrown buzz saw, the teeth of which do the gripping. As the car starts the wheel revolves its teeth, fitting between the cable bars, and when once braked up the car runs at the full speed of the cable. By loosening the brake so that the grip wheel can revolve slowly the speed of the car may be diminished. The conduit can be cleaned by merely dropping the cable to its floor, and letting it run for a few moments. This sweeps the dirt into pits placed at intervals whence it can be readily removed. No difficulty is observed in turning corners. The lot in which the trial took place was a square holding five hundred feet of track. All the cars were pulled around its four corners without trouble. "It is the best cable contrivance I have yet seen," said Mr. Hazzard. "Will we adopt it? Ah, that I cannot tell. Our committee will consider it. The question of the adoption of any system has not yet been reached by us. We inspect everything which seems to possess practical value. The system I have outlined to you possesses many advantages, apparently. We would not need to cut our cross ties to utilize it, the conduit being so small, and it is estimated that our lines would be equipped with it at a cost of not more than $40,000 per mile, including everything." Milton Wheaton's patent 192314. The "griper." May, 2012 Picture of the Month. Cleveland's Brooklyn Street Railroad converted to electric traction in June, 1888. If anyone knows which company, the Brooklyn Street Railroad or the South Side Railway, had the experimental installation, I'd be grateful to learn. From The Street Railway Journal, July, 1885. Volume I, Number 9. 317,139. 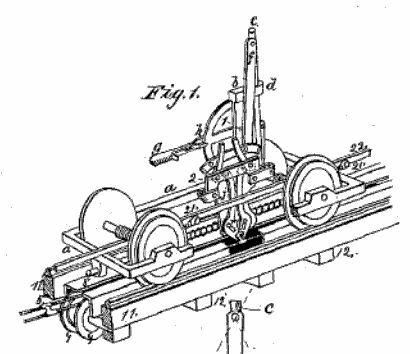 -- Cable railway mechanism -- T. L. Johnson, Cleveland, O. 317,140. -- Cable railway system -- T. L. Johnson, Cleveland, O. From Whipple's Electric, Gas and Street Railway Financial Reference Directory, 1890, by Fred H Whipple. Page 189. Brooklyn Street Railroad Co. Tom L. Johnson, President. A. L. Johnson, Vice-President. H. J. Davies, Secretary. J. J. Coleman, Superintendent. Annual meeting held in February. 23 miles, 4-8 1/2 gauge, 52 and 78 lb. girder rail, 120 cars, 50 horses, Thomson-Houston system. Y Y G.
South Side Street Railroad Co. A. L. Johnson, President. Tom L. Johnson, VicePresident. H. J. Davies, Secretary and Treasurer. J. J. Coleman, Superintendent. Annual meeting held in February. 9 miles, 4-8 1/2 gauge, 78 lb. girder rail, 20 cars, 10 horses, Thomson-Houston system. Ju. 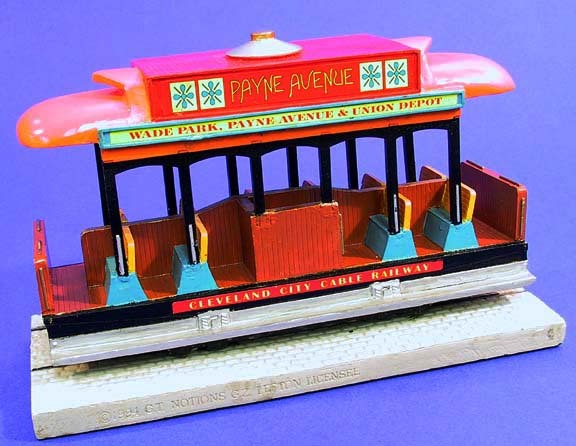 A Lefton model of a Cleveland City Cable Railway Payne Avenue grip car. January, 2011 Picture of Month. opened: 17-December-1890. From Union Station on Water Street (now West 9th Street) to Superior Avenue. Superior Avenue to Doan Street (now East 105th Street). opened: ??-December-1890. From Union Station on Water Street (now West 9th Street) to Superior Avenue. Superior Avenue to Payne Avenue. Payne Avenue to Wilson Avenue (now East 55th Street). Wilson Avenue to Lexington Avenue. Lexington Avenue to Madison Avenue (now East 79th Street). Madison Avenue to Hough Avenue. Hough Avenue to Doan Street (now East 105th Street). from the New York Sun, 19-January-1890. No thumbnail. notes: Frank DeHaas Robison, owner of the National League's Cleveland Spiders, also owned the horse car lines on the East side of Cleveland. He paid the cable railway trust for the rights to its patents and merged his horse car operating companies to create the Cleveland City Cable Railway. The company's lines were designed and built by Colonel William Henry Paine, who had been involved in several other cable railways including the one on the Brooklyn Bridge. Colonel Paine died on 31-December-1890, immediately after the lines opened. He may have overworked. Robert Gilham was consulting engineer. 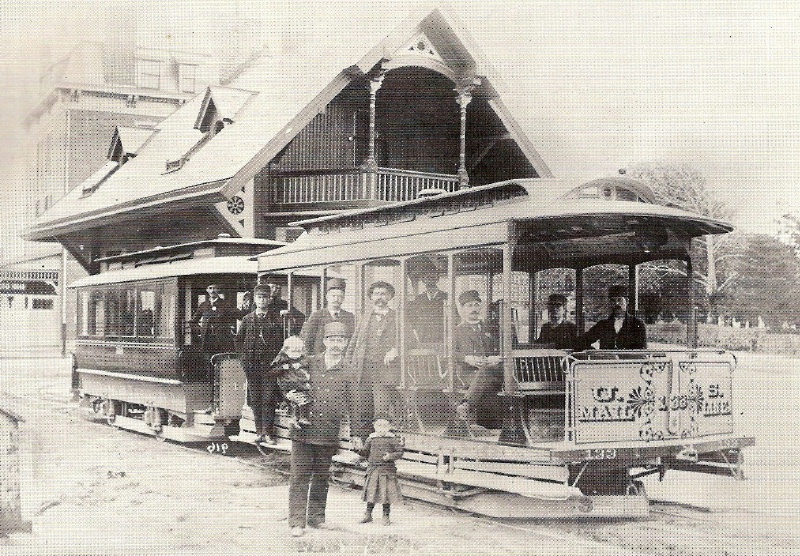 The Cleveland City Cable Railway built lines on Superior Avenue and Payne Avenue and planned to build one on Saint Clair Avenue, but it remained a horse car line until it was electrified in 1893. Each line was operated with two cables, driven from a powerhouse at Kirkland Street (now 49th Street) between Saint Clair Avenue and Superior Avenue. The Payne Avenue cables reached the line through a blind conduit. Winding Drums and Gearing of the City Cable Railway at Cleveland, Ohio (Source: Cleveland City Cable Railway, Manufacturer and Builder Magazine, November, 1891). The Superior Avenue cable that reached Public Square drove gear which powered an auxilliary cable at half speed, which carried the lines on to Cleveland Union Station. The auxilliary did not work very well, so the company extended the Payne Avenue cable through Public Square and on to Union Station. This was a questionable decision because it required great changes under the street and resulted in a long cable with a lot of curvature. 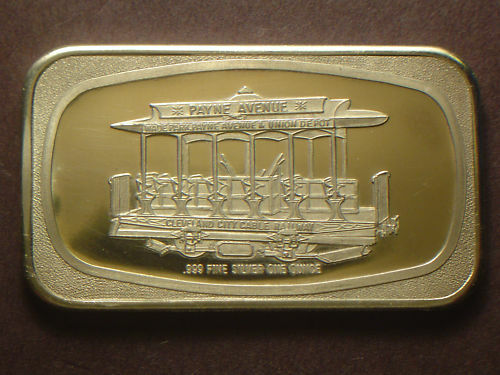 The Payne Avenue line never had as much traffic as the Superior Avenue line. In an effort to generate more traffic, Robison built an amusement park, Cable Park, at the end of the Payne Avenue line, and, in 1891, League Park at Lexington and Dunham for the Spiders. The Spiders, led by pitcher Cy Young, were a strong team, finishing second in 1892 and 1895-1896. In 1895-1896, the played the first-place Baltimore Orioles for the Temple Cup. Cleveland won in 1895 and lost in 1896. After that, the Spiders declined rapidly. In 1899 Robison bought the Saint Louis Browns (now Cardinals) and sent most of Cleveland's better players down to Missouri. The surviving Spiders went on to set the worst record in major league history: 20-134. This hurt traffic to League Park, especially when other league teams refused to travel to Cleveland and forced the Spiders to play most of their remaining games on the road. The American League Cleveland Indians later played in League Park. For some reason, a Cleveland City Cable Railway grip car was the subject presented on a silver ingot. In 1893, the company merged with lines owned by Senator Mark Hanna, William McKinley's political mentor, into the Cleveland City Railway. This company converted Superior Avenue to electic traction on 01-July-1900 and Payne Avenue on 20-January-1901. From The Street Railway Journal, April, 1889. Volume V, Number 4. A Cable System is being talked about in connection with the proposed new big belt line. It Has Been Stated by Mr. Robison, president of the Superior Street Railroad Co., that there was every prospect of the road being in working order by the Summer of 1890. The City Cable Railway Co. has been incorporated; capital stock, $100,000. Col. W. H. Paine has been appointed the engineer of the new cable company formed in Cleveland, the officers of which are Frank De Haas Robison, president; Geo. H. Holt (New York), vice president; G. D. L'Huillier, secretary and treasurer, and Jno. J. Shipherd, assistant secretary and treasurer. From The Street Railway Journal, September, 1889. Volume V, Number 9. The contract for supplying the slot rails for the new Superior Street cable road has been awarded Messrs. Wm. Wharton & Co., of Philadelphia. It is probable, so it is said, that Messrs. Hathaway & Robison will themselves undertake the construction of the road-bed. From The Street Railway Journal, December, 1889. Volume V, Number 12. 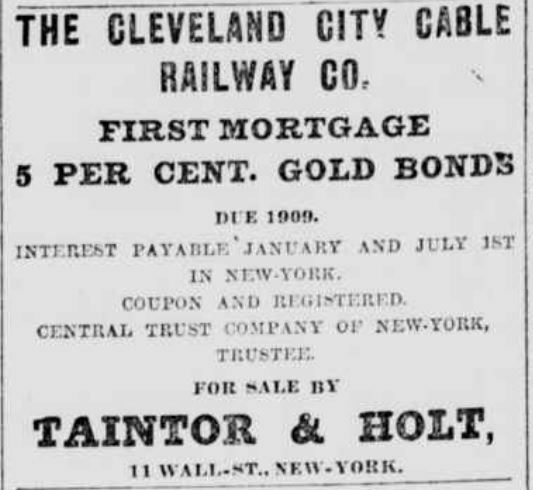 The Cleveland City Cable Railway Co. have purchased the right to use the letters patent owned and controlled by the National Cable Railway Co., of New York, and are now engaged in constructing a first-class cable road, under the direction of Col. Wm. H. Paine, on Superior Street. Frank De Haas Robinson (sic - JT), president of the Cleveland Cable Railway Co., and Mr. Chas. Hathaway, have lately made an extended tour of inspection of the cable systems of the country, with a view of adopting points in each that seemed best for the new line which they are about to construct in Cleveland. Both gentlemen speak very highly of the different systems they saw, and were especially pleased with the one in Denver. From The Street Railway Journal, January, 1895. Volume XI, Number 1. Good Work in Cleveland, O. The power houses and car shops of the Cleveland City Railway Company are in excellent condition, and the company's chief engineer and electrician, Mr. Sheehan, has recently inaugurated a number of improvements both in the cable and electrical departments. The company is using the Roebling cables, and has in its possession a cable which has run more than thirteen months without a moment's loss of time, this being a remarkable record, creditable alike to the manufacturers and to the company's engineers. The overhead line material on the electric lines was designed chiefly by Mr. Sheehan. Brass hangers, with wood insulation, are used, and are giving excellent satisfaction. The company believes in taking good care of its cars, which are washed down daily, and which receive one or more coats of varnish before being put away for the season. Cleveland City Cable Railway Co. Frank De H. Robison, President. Geo. H. Holt, Vice-President. John J. Shipherd, Secretary. M. G. Robison, Treasurer. 32 miles. 4-8 1/2 gauge, 78 lb. steel T rail, 80 to 100 cars, 500 horses. Ju. From Manual of Statistics, Stock Exchange Hand-book, 1893, by Financial News Association. Page 430. CLEVELAND CITY CABLE RAILWAY CO.--Mileage 83. Cable and Horses. Cars 78. Capital $4,000,000. Shares $100. Bonded debt $1,884,000 5 per cent. 1st Mortgage bonds, interest payable January and July. Trustee Central Trust Co., New York. Gross earnings, fiscal year ending July 1,1892, $368,900. Net earnings $118,000. Officers--President, F. DeH. Robison; Vice-President and Treasurer, John J. Shipherd; Secretary, W. Parsons. Directors--Geo. H. Holt, F. DeH. Robison, M. G. Robison, Jr., C. Hathaway, John J. Shipherd. Office, 1094 Superior Street, Cleveland. from the New York Sun, 16-March-1897. No thumbnail. Copyright 2010-2017 by Joe Thompson. All rights reserved.